Magazines have been sounding the death knell for skinny jeans for years, and while you can rarely beat a pair of black skinnies and a nice top there are new and more jean styles creeping into stores. As Topshop releases four brand new jean styles, it looks like they might finally be on the way out. Anyone with an Instagram account will have noticed that last year was all about the Mom jean, the high-waisted, wide-wide leg, tapered silhouette that - incredibly - seemed to go with everything, from blazers and turtlenecks to cropped tops and fuzzy jumpers. With legs across the world fully liberated from the binds of skinny jeans, Topshop has released four looser fit styles, including the Editor, a straight-leg style with a flattering high-waist cut just crying out for a silk shirt half tucked in, half out. At €68, they're slightly more expensive than most high street jean options, but with Topshop typically delivers on durability. Urban Outfitters has a similar style, in their usual soft fabric and punchy colours. A light fraying at the hem helps elongate legs, and looks particularly stylish grazing military style boots or chic kitten heels. Meanwhile, Mango has a slightly more affordable version with a large turned up hem, which would work well with everything from utilitarian-inspired looks to pared-back casual workwear. If you are now a full convert to the wide-leg team, you're in luck. 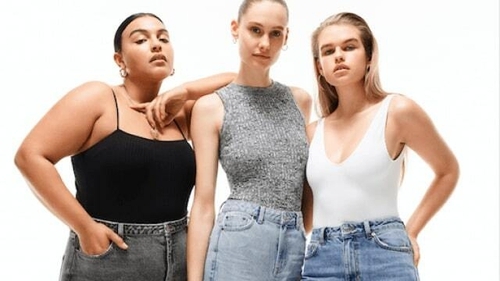 Capitalising on the success of 'Mom' jeans, Topshop has now released 'Dad' jeans, a mid-rise, loose straight fit with a hem 'that sits on the shoe'. 'Mom' jeans are still very on trend, and now come in any and all shades of the rainbow. You can never beat classic blue denim, all the same, and if you're missing this new wardrobe staple, River Island has a perfect pair on sale now. If the name is to be believed, Topshop may have reached maximum wide-leg jean capacity with the 'Balloon Boyfriend', a style features a loose slouchy fit that's tapered through the leg with a hem that sits above the ankle. For the wide-leg skeptic, there's a happy medium to be found in the 'Slim Wide'. With a high-waist cut and wide leg with a hem that comes to the floor, we expect this cut to elongate and slim, making it ideal for pairing with sleek mesh tops or slouchy jumpers. Urban Outfitters has been offering a similar style for some time now, in their 'Puddle' range: a slouchy, wide-fit, high-rise that sends us straight back to listening to Avril Lavigne in our rooms in the early 2000's. Zara have a few similar styles, too, such as the Premium Marine Culotte Khaki Coated jeans, a wide-leg fit in a soft and endlessly wearable khaki shade.